Turning a Microcar into a Functioning Computer Mouse? Ever look at a small car and wonder “what if I could make that a computer mouse?” You probably haven’t. However, YouTube tech tinkerer William Osman and comedian/robotics expert Simone Giertz put their heads together to do just that. They managed to transform her yellow “Cheese Louise” electric car into functioning computer mouse. The video that shows off the inventors’ handiwork doesn’t necessarily dive deep into the nitty-gritty as to how they made this work. We do know for sure that they placed a unique sensor they’ve placed on the front of the car. And we did get to see the results. In the video, the two go to a parking lot to test out the mouse-car. It can move the cursor by driving and it’s the honking that clicks. The real test was attempting to draw the car Photoshop. Unfortunately things don’t quite go according to plan. They did manage to draw a triangle and not a very good one, however part of the blame is that Photoshop crashed a few times. The car isn’t something you can buy at any dealership. It’s affectionately called “Cheese Louise,” and it’s a canary-yellow Comuta-Car — an electric car from the 80s which looks like a sentient, upside-down wedge. 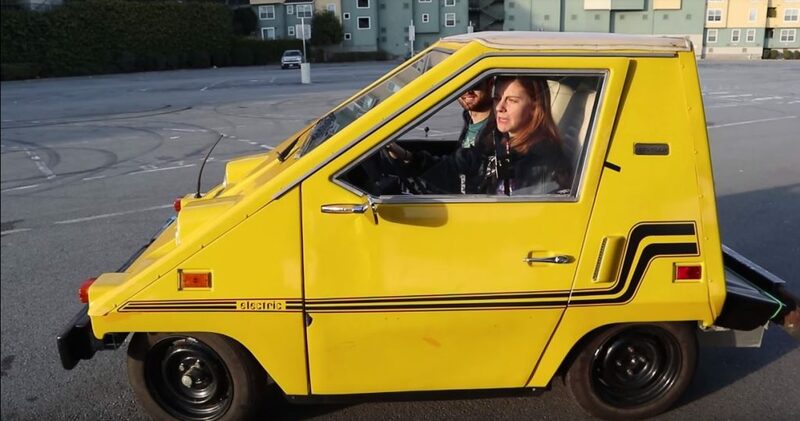 It’s actually Simone Giertz’s real car and she modified it to keep it running and legally drivable. Her partner for this project is William Osman, who used an old optical mouse as the template for how they were going to do this. They used a whole new lens (to keep the mouse functioning while several inches off the ground) together with an Arduino Pro and a few other components all in order to get the mouse to work while strapped to the car’s bumper. The button for clicking was placed under the horn honker. They used a spacious parking lot which for all intents and purposes is now technically the world’s largest mouse pad. At one point Osman addressed how “this project was like gluing a pencil to your desk in your office in a skyscraper in order to make it the world’s biggest pencil. However the difference is functionality even if there are limits. For instance, the mouse strapped to the car will only ever detect up and down. In order to move the cursor sideways, you’d have to move the car sideways which is usually something unwanted. In order to get around that limit, where when moving a mouse, you hold the device pointing directly ahead and move in any desired direction, rather than turning and aiming, Osman made some modifications. Osman and Giertz attached a mouse with a PS/2 connection (a plug that pre-dates USB) to an Arduino Pro Micro-electronic platform, and then hooked up an HMC5883 magnetometer. In plain English, they created a makeshift system to tell the computer what direction the car was facing. The other issue is that mice only work from a certain distance away from a computer, even with Bluetooth. So the team utilized a big bundle of M12-threaded lens mount bundles to attach one of a number of miniature lenses to the mouse and then adjusted it on the outside of the car to so that the computer could pick up the movement.